Today, we are starting a gradual roll-out of the new version of Opera Max. As the leading data management and data saving app for Android, Opera Max provides tools to make your app data usage more transparent so that you can easily control when and how to use up your data plan. 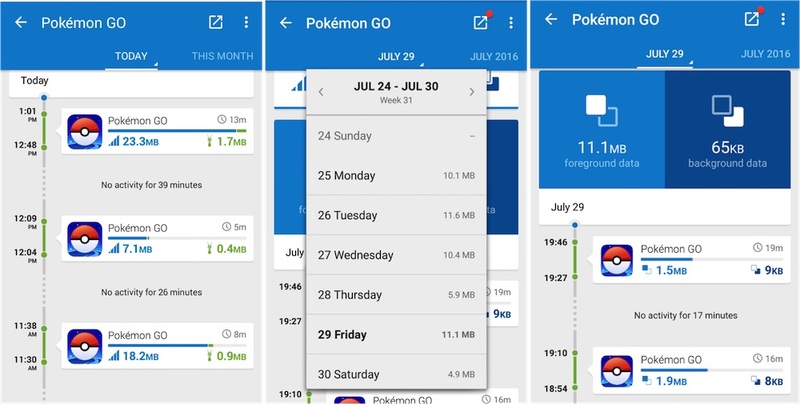 One of these tools is the “data usage timeline”, which gives you a visual overview of exactly what your apps do with your data plan. Now, we want to take this transparency one step further by creating a “privacy” timeline. We call this “privacy mode”, a powerful feature that helps you enhance your mobile privacy on your Android device across virtually all of your apps. This feature was first seen in Samsung’s S Secure mode on the Samsung Galaxy J5 Prime and Galaxy J7 Prime phones. Please bear with us with the gradual roll-out. We hope to have the all-new privacy mode available for all Android devices and models soon. Did you know that thousands of apps are misbehaving and tracking you for selfish reasons? These apps send out hundreds, even thousands, of requests per day to third parties and put your privacy at risk. 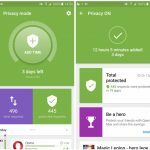 Now, Opera Max’s privacy mode reveals which apps are bad and which apps are good in terms of sharing your data with third parties. Showing this at an app-specific level is a breakthrough in mobile privacy tools. To see real-time privacy alerts, we encourage you to scroll up and down the privacy mode timeline regularly and also tap on individual timeline cards to see the “privacy breakdown” of what an app did in a particular session. This is a useful tool to let you know when your apps put your private data at risk. Have you ever experienced that creepy ad-tracking effect on your phone? The one where products you were checking out on various websites start showing up on every other webpage you visit? This happens because web- and ad-trackers are collecting your private data and tagging you for retargeting by future ads. Tracking JS scripts and cookies are some of the most common ways websites tag you. On average, more than 300 trackers a day report my info to other companies. Some of you may attract even more because of the apps you installed or the websites you browse. At Opera, we think this kind of retargeting is creepy and annoying. 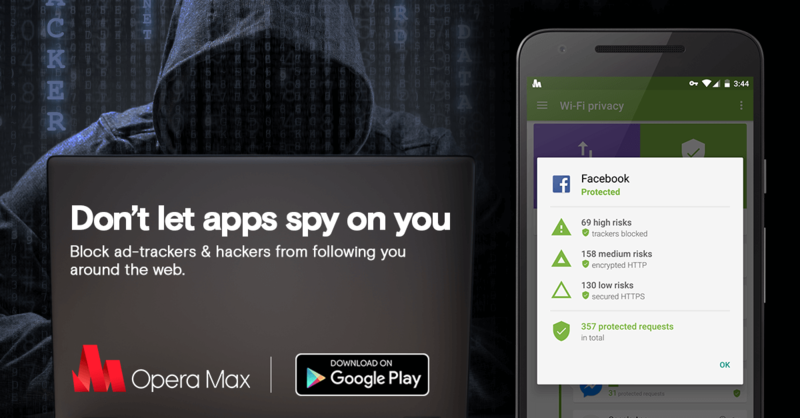 Now, Opera Max’s privacy mode will not only reveal which apps are high privacy risks, but can help you block these trackers. Blocking trackers will make you less of a target for various sites and apps that want to retarget you with their ads. We base the core of our blocking mechanisms on the EasyPrivacy filter list, which is a reliable, open-source platform used by other ad-blocking services as well. It helps reduce the amount of profiling you are subjected to. 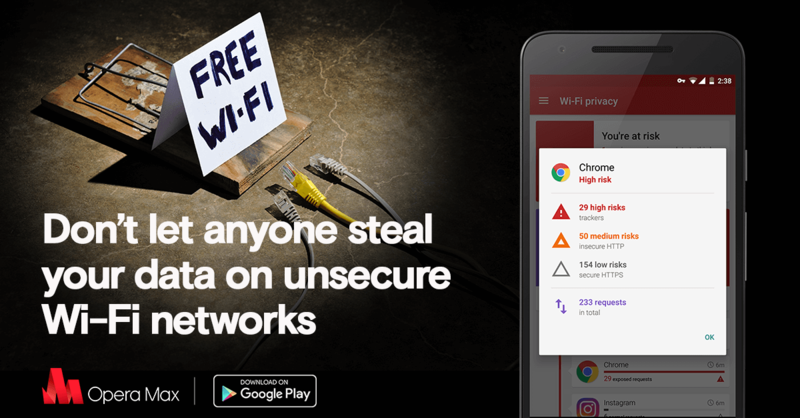 Using apps on your Android device on public Wi-Fi network is like opening a door for cybercriminals to access your important data, including account names, passwords, conversations and more. How? Hackers can intercept all of your traffic and read everything you send that is not encrypted (i.e., anything that is http is very risky). Now, with privacy mode in the new version of Opera Max, you can encrypt your app data and browsing traffic on Wi-Fi with a tap of a button. This offers you an additional layer of privacy and security so that you can have peace of mind when connecting your phone to public Wi-Fi networks. We hope you like the changes we’ve brought to the all-new version of Opera Max. Try it out today and let us know your feedback about this new feature.